Pielke Sr. on RC – continued misinformation | Watts Up With That? Over at Real Climate, quite a few of the comments that they post continue to incorrectly interpret the observed behavior of the global average upper ocean heat content changes and sea level rise over the last 5 years (see the misinformation in the comments on the Real Climate weblog More bubkes). The authors of Real Climate, unfortunately, are permitting this erroneous information (and personal insults) to be posted without their comments and correction. Apparently, the balance provided by Gavin Schmidt that I reported on in my weblog Gavin Schmidt’s Interview On Media Hype On Climate Science Issues was just a fluke. In this weblog, I will correct two of the major errors made in a number of the comments on the Real Climate website. This paper supports both conclusions in my recent weblogs (see and see) that the sea level rise has flattened and that the upper ocean heat content changes have been essentially flat since 2004. Even a causal view of the Levitus et al figure, which is reproduced in my weblog, shows that upper ocean heat content has been flat in their data for the last 4 years. The large rise just before than is suspicious (as I am told by colleagues working of this subject), and, moreover, is not consistent with the sea surface temperature trends for this time period (see the GISS data on the ocean surface temperature trends at http://data.giss.nasa.gov/gistemp/2008/Fig2b.gif). Thus even the group that Gavin Schmidt works for (GISS) presents data with no sharp spike that is at all consistent with the Levitus et al analysis and, moreover, the GISS analysis shows that the global average sea surface temperature has been essentially flat since 2002! All of these analyses are consistent with no significant heating in the upper ocean and a flattening of sea level rise, and even more clearly, that these climate metrics are not “progressing faster than was expected a few years ago”. Real Climate has it backwards; these climate metrics are changing less than was expected a few years ago! This finding is not flat, but it is not still does not support the claim by Real Climate that this climate metric “is progressing faster than was expected a few years ago”. In fact, this rate of sea level rise is even less than reported in Cazenave et al 2009! 1. Using the upper ocean heat data from 2004 to the present, what is the Real Climate best estimate of the accumulation of heat in Joules? 2. Using that value of heat accumulation, what is the diagnosed global average radiative imbalance over the time period? How does this compare with Jim Hansen’s value of an imbalance of 0.85 W/m2 for the end of the 1990s? These are well defined scientific questions. If Real Climate provides clear answers to them, we have moved forward to a more constructive scientific debate. I will keep you posted. July 6, 2009 in Ridiculae, Science. I have posted to a couple of the pro-AGW sites. They don’t let my posts see the light of day. Which is why you are not going to get a straight answer. RealClimate, as usual, will hide out from answering any tough questions like those in the article. But kudos for that great pic of the Iraqi Information Minister, Muhammed Saeed al-Sahaf (M.S.S.) — who was invariably so completely wrong [click] that he morphed into campy entertainment [“I triple guarantee you, there are no American soldiers in Baghdad”]. I recall the Iraqi I.M. stating on-camera that the U.S.-led invasion was propaganda, and that it was not happening — just as the coalition tanks were rolling into Bagdad. It would surprise me if you got a sensible discussion of these issues at Real Climate. They tend to move on to another topic when pressed to explain in detail. The real question is — How much will CO2 go down per triilion in new taxes? Optional extra credit — How do taxes make the CO2 go down? Or the temperature for that matter. OT, but I was wondering if anybody has compiled a massive study of the effects on the environment by building Water Dams? Have seen a couple of articles that say dam building contributes to “Climate Change”. I have remember watching a documentary of small city (I forget wich country on the Euro/Asia Continent) that fishing was a major part of the economy but after decades of their government and others redirecting and damming the rivers that fed the HUGE lake they once fished in turn it into a small pond that it’s only hope of ever gaining in volume again is either by rain that never comes or by restoring the natural path of the rivers. At the time of the documentary the locals said they never used to get sand storms and the city used be very green(plant life). I think this particular “human influence on climate” is far greater than producing a little extra carbon. Here is a link that talks about from a global warming standpoint it also does not mention redirection in this case. But I do know there are situations in which this occurs, reeking havoc on the local environments of the populations that used to be down stream. I apologize for getting off topic, but it something I just thought of. I will keep digging for more info on my, but just wondered if that had been covered here before or not? LOL at your graphic – Gavin Schmidt = Baghdad Bob! It is now painfully clear that Real Climate is a propaganda outlet that exists only to promulgate lies, lies which are intended only to serve the personal and political goals of an outrageously mendacious pack of liars. Tariq Aziz! I wonder what happened to him. Oops here is the site. Not exactly what I was talking about, but it does touch on the subject. Science is supposed to be concerned about precision. I applaud Dr. Pielke for his sharp eye in noticing the details and contradictions. He is an example for anyone. Scientists are not supposed to be sheep. This is why I tend to stay away from RC, not only because they do stuff like this, but because of all the Ad Hominem, and personal attacks that sometimes occur there. RC is not the only ones that do it. Kudos on trying to keep them on their toes. Even if they do not allow “real” (pun intended) facts that are not slanted in their favour to be debated. Litigators have a maxim: If the law is on your side, argue the law; If the facts are on your side, argue the facts. If neither the law nor the facts support your case, pound your shoe on the table while yelling loudly to try to intimidate your opponent. I think we know where RC is on this one. Real Climate will not answer these questions honestly at all. They have circled the wagons on Rahmstorf’s graph in the Copenhagen report, even though Steve McIntyre, with the assistance of Jean S and others have demonstrated mathematically and irrefutably that he had his thumb on the scales. The “team’ are without ethics or principles, and should make honest scientists vomit. This is an opportunity to “record” these exchanges which may be relevant in the future when the lawyers are called in take note…. This is quite an interesting phenomena. Also in Belgium and The Netherlands AGW sites do sometimes refuse to place comments from “skeptists”. Worser though, some do consider a link to WUWT as dealing with the devil. On the other hand these AGW guys do like sites like Climatedenial.org very much. Try to read one of the contributions of George Marshall. Dr. Pileke is a man of great integrity. We are fortunate that he has devoted his life to excercising that integrity. Climate science can be greatly improved by the broad application of the integrity and strong analytical skills Dr. Pielke exemplifies so well. AGW, as opposed to climate science, ahs always been a social movement. AGW only uses climate science to accomplish its social goals. Ding! The light bulb is going on!!! Climate was NEVER the issue. Control of resources and revenue was always the issue. It is the only issue. That is why the actual science is irrelevant – useful if it supports the agenda, but something to be buried if it doesn’t. A leading climate scientist argues that overbroad claims by some researchers—coupled with overblown reporting in the media—can undermine the public’s understanding of climate issues. Gavin Schmidt, a NASA climate modeler, author and PM editorial advisor, concurs with the consensus view that the planet’s temperature is rising due largely to human activity. But, he says, many news stories prematurely attribute local or regional phenomena to climate change. This can lead to the dissemination of vague, out-of-context or flat-wrong information to the public. I have always chuckled at the notion of a bunch of climate modelers naming their site *Real Climate! * Do you think those guys have an over-inflated view on the quality of their work? There was a thread on this under Bubte 2 on wuwt which did lead to some confusion. I have already seen the Cazanave paper (thanks to Roger’s web) and it clearly states (as has been shown above) that ocean levels are rising more slowly than was reported in AR4. I could not reconcile this with the copenhagen report which warmists are waving under everyones noses, which is saying what seems to be the opposite. That is, sea levels are rising faster, or at the upper end of previous estimates. Fortunately, a warmist happened to be among the bloggers, and may have resolved the conflict. He rebuked everyone for their ignorance and explained that the copenhagen report clearly refers to the estimates made in 1990, not 2007. So, has the mystery now been solved? The plot thickens. BTW, and OT, I see Krugman has jumped onboard the warmist waggon by calling traitors, any representative who voted against Waxman-Markey. Unsurprisingly, he was published by curtousy of NYT. Hasn’t anyone pointed out that Krugman’s an Economist not a climate scientist or does that only work the other way? Why even respond to these people, who time and again have proven themselves to be nothing more than science crackpots driven by a let’s-regulate-the-masses agenda? My daughter made a presentation in her class awhile back and in just 15 minutes she was able to convince the entire class and the teacher! that AGW is nothing more than a lot of hot air driven by special interest. The science is settled, so of course its no longer an issue, its time to act. Time to impose taxes beyond believe wich wil make the raid by Iraqi forces on the vaults of kuwait during the 2nd Gulf War (Iraq v.s. Iran in the eighties is the first in my book) like stealing from a cookie-jar. On Sahaf and the others, the best moment in the third Gulf War when two high ranking Iraqi officers (and a very nervous adjudant pointing various locations on a map) where explaning on Live on TV that the glorious armies of Iraq where driving the Capitalist infidels whatever back into the Gulf. All this while bombs rained down around the building shattering the windows and ripping the curtains to threads. That’s right – only 15 minutes! I.e. about same amount of time it took Lindzen, Crichton and Stott to cream Gavin and his muppets on NPR radio. Ah, yes. Baghdad Bob. His press conferences provided the only truly comic moments of the Iraq War. While the Team is not yet backed into so cramped a corner as poor Bob was finally, it is also true that the infidels are at the gates. Devil his due, Hansen is a trained scientist-Gore is a failed divinity student-is the one in whom the News Media breathlessly listens. All Right, then, we have the real Information Officer for the Climate Models pictured top of the page. The “Mother of all Models” says it all. First, what an astounding resource you have made, Anthony. Like many of the readers of WUWT, I am not a scientist, and being able to gradually get a handle on the facts and fictions surrounding the climate ‘issue’ has been an enormous help in resisting the angst-ridden rhetoric of the alarmist fraternity. I am particularly happy my close family has been able to see through it. I have a twelve-year-old who might have been vulnerable to the ‘Inconvenient Truth’ style of polemic. Credit goes to you and your associates. The (other) point I want to make concerns comments, and their moderation. Now, I swear fairly regularly. And ad hominem flaming has it’s place on many blogs. But in any discussion about factual matters the end result is almost always more heat than light. In the search for the facts on climate (or anything else?) the presence of consideration, humour and old fashioned manners is hugely important, and the rigorous insistence on courtesy displayed by WUWT (and others- Steve Macintyre at Climate Audit, eg) is crucial to the whole debate. And over the last couple of years, I have found the aforementioned characteristics to be far more in evidence in the posted comments of the ‘sceptics’ (realists!) than those of the alarmists. And that really helps to win the argument, or to introduce the alternative view. Nobody likes to be yelled at when they’re trying to understand something. I am not going to hold my breath waiting for the retractions/corrections. Sometimes I learn more from opponents than I do from supporters. But it’s a funny process. Because they make me feel physically sick, I can only take RC in small doses at large intervals, and usually only when a warmist insists I need to read RC x…. to know “the truth”. Well I follow Great Spirit in this, to the best of my humble ability, and invariably RC comes up trumps… with a classic boo-boo (I can now say, bubkes) or they provide me with a trail to a piece of information I needed, either to understand interesting elements of science, politics, or psychology better, or to scotch them further, or both. oh, BTW, Pierre G, congrats to your daughter. Re Pierre Gosselin (09:05:17) – I would like to see the presentation uploaded. Good work! Your analogy is excellent, and even extends to the sale of indulgences (i.e. carbon credits) to finance extravegant lifestyles (somebody’s 24,000 sf mansion). The “Green Gastapo” has arrived!! You didn’t think the government was going to take your word for how much energy you used, and how green or non-green it was. Now we have the perfect excuse for the government to pick winners and losers, and reward friends and punish opposition. The “Green Utopia” has finally arrived. If you feel a boot on your neck, remember it is for your own good. Climate was never the issue except as a means to Power and Control. I’m afraid you’ve put Luther in the wrong camp. He would have been right at home on RC. It seems Luther would have been right at home at RC. Thanks much. Please disregard my second attempt. We are being bamboozled by science which likes to have a nice graph to explain everything, unfortunately the real world is more complicated than that. Global sea levels are -like global temperatures-a nonsensical artefact dreamt up in a computer laboratory. The latest IPCC assessment confirms sea level calculations from 1993 are by satellite and are linked to in ‘more bubkes’ in Pielkes firsat paragraph. Both the following two sites give a good description of the process-which is being constantly refined but doesn’t get more accurate as the inherent flaws in measuring capabilities can’t be resolved. The UK Environment Agency -where possible like to use physical tide gauges as well as satellites when developing flood defence schemes, which are visually observed or can send data electronically. Best of all is gathering information from local people such as the Harbour master or those who work the fishing boats and who know what is really happening. Modern Sea level rises -where happening- are not being seen in context as yet another of those regular cycles that stretch back much further than the satellite records into the depths of recorded time. Ancient Greek explorer Pytheas travelled to Iceland and not only discovered the frozen seas lying one days journey beyond, but was the first to quantify the moons action as being responsible for tides, and took physical measurements of heights. Sea level heights are generally said to be lower today than back in the Roman warm period and Mwp. Sea castles in the UK built in the 11th century are now above the sea level entrances which ships used to re-supply them. Cardigan Bay at that time washed the base of the rock upon which the castle stands. Greater vigilance on the part of the attacking force stopped this and the castle was surrendered in the spring of the year. The following pictures show the current location of the sea. Sea levels AND temperatures were higher in the MWP and the Roman warm periods and presumably other extended warm periods. The above link dissects the data and states that a rise by 2100 of 5cm is possible…. plus or minus 15cm! Morner stresses (as I do) that observational data contradicts the theoretical interpolated and massaged data that is used by the IPCC. John Daly also had a good handle on all this. To reach a 1 metre increase by 2100 means an average of nearly 11mm a year (only 91 years remaining). There is simply no evidence to show this is happening. We must stop looking at just a few years of data as ‘proof’ of rising levels , and instead view things in a historic context, whilst retaining a great deal of scepticism at the notion you can create a highly accurate global figure in the first place. Certainly two old shoes would be more just. The U of Colorado sea level graphs show periods of climb, then level offs. ’93 to ’97 was a level, then a climb to the level off ’98 to 2000. I did an eyeball on the 2005 to present last month and guessed around 2.7 mm/yr. I would expect it to start climbing again in a year or so. A very rough average since the last ice age would be about 10 mm/yr, with the decline to the modern rate around seven thousand years ago. What we’re getting may be the top of the curve before the interglacial ends. That is, sea levels are rising faster, or at the upper end of previous estimates. They might be, if you measure in very specific areas. There is no meaningful metric called “global seal levels”, just as there is no meaningful metric called “global temperature anomaly” or “global temperature” or “global climate”. Good post, as always. It would be interesting hearing a true believer’s explanation of the observed fact that a castle’s sea level gate is now well above sea level. Warming is still hiding in the pipeline, maybe? The AGW contingent, having to deal with the fact that the sea level is not rising any more now than it has in the pre-industrial era, has taken the easy way out of their conundrum, and they now simply lie about it: a study in the AAAS journal Science claims that by the end of this century temperatures could be comparable to those 130,000 years ago, when global sea levels were about 20 feet higher. Well, maybe ‘lie about it’ is a bit harsh. But when the models don’t match the observations… it is the models that are wrong. Entirely too much credence has been placed in always-inaccurate computer models, and not nearly enough has been placed in verifiable, real world observations. 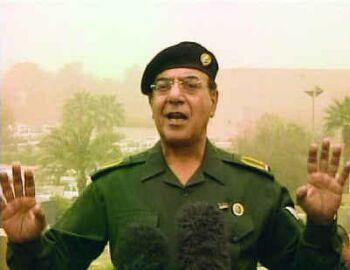 For reference, on this side of the pond, Baghdad Bob was known as Comical Ali. I would like to put forward once again the idea of a shadow RC blog. Basically borrow their posting, copy all their comments over, but allow skeptical comments through. Some of the puritans might come to visit. So whatever happened to Baghdad Bob? Was he on the deck of cards? I actually met ‘comical Ali’s’ boss-Sadaam Hussein- in Baghdad in the mid 70’s. An interesting guy even then, and I followed his subsequent ‘career’ with interest. I also met the Shah of Iran around the same time. It is my experience that Dictators (or those with unchallenged power) tend to surround themselves with sycophants and only hear what they want to hear. Nothing is allowed to disturb their version of the world. Leaving aside the homicidal tendencies of course, the core attitude is one that seems prevalent to those with a closed mind and who steadfastly believe they can’t be wrong on such things as AGW. The place is the Aral Sea, in what used to be Soviet Russia and is now Kazakstan. The Russians dammed up the river in many places, and used the water to grow cotton. Cotton is a water-intensive crop. The amount of water taken from the Syrdarya(sp?) and Amu Darya Rivers has caused the level of the shallow sea to drop some 40 feet since 1950. Some of the “seacoast” villages of the 1950s are now tens of miles from water, and most of the aquatic life formerly abundant enough in the sea to support a varied fishing industry has disappeared. Much of this has been caused by chemical contamination as well as lack of habitat. The Aral Sea incident is indeed a human-caused “climate change”, as well as bringing devastating change to habitat and human livelihood. Let’s face it. Gavin is a good politician. He could say the correct words to meet the expectation of his audience. After all climate change today is more of politics than science. Hansen is almost 100 per cent advocate than a scientist. The most vocal advocates following Hansen and Gavin does not even understand what is the peer review process, yet they are they ones trying to impress the public they are 100 per cent correct by waving peer reviewed journals. The state of public policy is what is commonly known by policy professionals as “moral panic” and very few politicians could ignore the impact of “moral panic” in their decision making. Even if the policy wll cost a trillion dollar, it is not their mony but they failed to resond to the “moral panic” it is their career, power, and the peeks of office that goes out. If things goes wrong within their watch and the moral panic subsides, a good politician could always find ways to switch their stand. After all they could always claim they are not scientists and they were mislead by people who claim they are experts. RE: smallz79. Get a map of the world and try to find the reservoirs while keeping your eye on all that ocean. The amount of land area taken up by all the reservoirs just might be on the same scale as the amount of human generated CO2 in the atmosphere. This is not to say that large reservoirs have no effects on local climate. That REUK website is in the business of trying to make money off the AGW scare. And Pierre, could you please send your daughter out on tour? When I first got into the “AGW” debate, there were several blogs I would visit: RC, Rabbit Run, and Open Mind (along with CA and WUWT, of course). Over time, the list got shorter and shorter – primarily because comments were never posted, not answered (or answered rudely), or the fact that the people who wrote the blogs never seemed to admit who they were or how their “speciality” tied in to climate science. 1. If CA or WUWT talked about a Team paper, the silence was deafening from the other blogs (errors in team papers are never mentioned, and not allowed to be discussed in comments). 2. Those papers that are dissected in great detail were those that went against the consensus. 3. The cadre of regulars who “troll” the board, offering nothing to the discussions other than ad-homs and personal attacks. And at least once in each comment string, was the usual CA and WUWT put-down. 4. Not friendly. Ask what is, to you, a serious question, and it’s like you set off a bomb. “We’re not going to do your homework for you”, “Read the papers”, or a reciting of “The List” (all the observations that “prove” their point). 5. Total lack of “openness”. Just look at their sites. CA and WUWT have links to their sites, and they won’t link back. It’s the whole “he who must not be named” process. OT, but I was wondering if anybody has compiled a massive study of the effects on the environment by building Water Dams? I doubt dams per se have much effect on the environment and climate. However, most dam water is used for irrigation. And irrigation is easily the largest scale environmental change of the last 50 to 100 years. In excess of 600 million acres are irrigated. In many and perhaps most places, the majority of irrigated water is lost thru evaporation. Which means it becomes the most potent greenhouse gas. I’m not aware of anyone having quantified the greenhouse effect from irrigation, but where I live in Western Australia, the days when we have clear skies and near ground humidity are easily our hottest days (and nights). Even a small increase in humidity affects temperatures. Your brevitas has perhaps been too much of a challenge to posters who have questioned you. I find the post relevant to the current situation and indeed enlightening. This blog grows apace as a civilization, wherein philosophy and science are mutually informative. Science must needs provide the immutable answers to the current debate about the climate, but philosophy must provide the explanation to the masses. Your references to Luther and Galileo lead inexorably to Phythagoras and the Ionians. Nothing is new under the sun. So whatever happened to Baghdad Bob? Had a facelift and changed his name to Robert Gibbs. Since Luther bet his life standing on his principles, he’d be less at home on RC than Galileo, who caved. Douglas DC: Your references to Luther and Galileo lead inexorably to Phythagoras and the Ionians. Mike– Standing on principle is an admirable characteristic, but somewhat less so when you’re wrong, as Luther was about Copernicus. My point was, his reliance on “sacred Scripture” and Ptolemaic orthodoxy has a familiar ring to those who’ve encountered AGW true believers. Of course, Luther lived before the establishment of modern, scientific method. What’s their excuse? Neither will I condemn Galileo, for having the good sense to save his own life. He knew the cat was out of the bag, and that even the Vatican astronomers quietly agreed with him and had to keep their mouths shut too. Don’t want to lose your funding– or your head. It’s amazing isn’t it? The science may have advanced, but politics is the same old s–t. The stories of Galileo and Luther just show that human nature is so often just not that simple (which is why it can take so long to unravel the “real” truth about Climate Science). The version I’ve heard is that Galileo stood up to mocked the Pope, and after earlier (moderate) friendship and acceptance, the Pope had had enough. Luther stood by his principles at great personal risk and cost – and helped a lot of people. So he was no better as a scientist than the “consensus” of his time! or at least, he had enough other things to worry about. A contemporary parallel for me is CSICOP and those Skeptics. I’ve found stuff they and Randi have done that is contemptible (like much of RC) IMO. But I don’t therefore automatically disagree with CSICOP members posting on Climate Skepticism here. As to Pythagoras, who today is aware that he was an initiate into the Egyptian and Babylonian mysteries, and ran a whole mystery school concerned with sacred number (among many other things) at Crotona? But Giordano Bruno didn’t and look what happened to him. does the army uniform mean that global warming is a hoax? 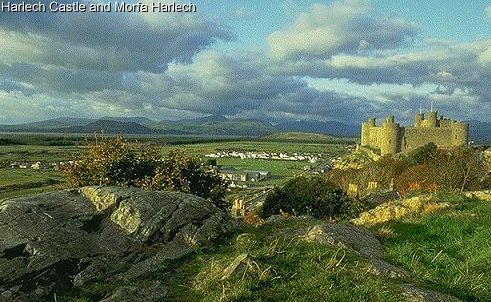 Maybe what happened at Harlech has more to do with growth in population, conversion of forest to fields, and erosion in the drainage of the Afon Gamlan than with sea level changes. The ancient port of Rome, Ostia Antica, founded about 400 BC, silted in and was abandoned by about 500 AD because of population and land use changes in the Tiber drainage increasing erosion and sediment transport, which eventually buried(and preserved for archaelogists!) much of the city. “Those who do not learn from history are doomed to repeat it”- George Santayana. What’s your point? That silting changes the sea level? 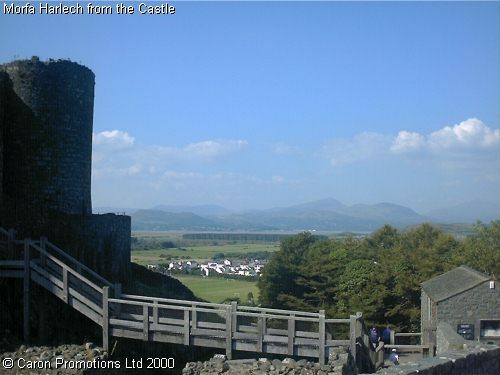 I’m suggesting that siltation is why Harlech castle is now “high and dry”, NOT a fall in seal level. If you read my earlier post you will see I specifically made reference to the fact that siltation was NOT a factor. There have been many papers published on it and numerous ‘digs’ one of which I participated in. It is sea level fall that has caused the difference-which is not to say for a moment thatr there has not been any siltation. I did hear about one study (no link, unfortunately) that mentioned the deltas of the rivers are receeding because lack of dirt washing down the rivers. Most of the dirt is being caught behind the dams (reducing their capacities). The mouth of the Mississippi was one example. Here, the wetlands are receeding, and very little new dirt coming down river to fill it back in. Add to that the levee system around some sections (to keep river in banks) also prevents new dirt from washing in.